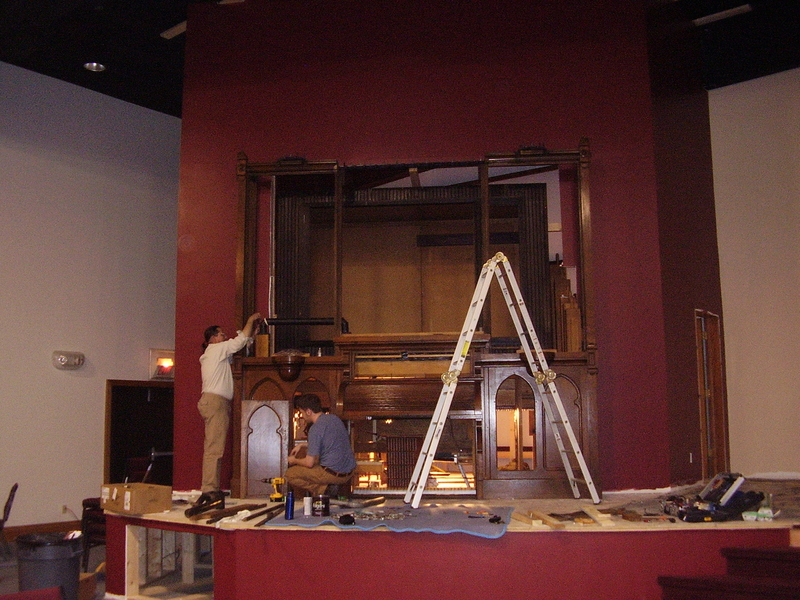 The organ begins to take shape in its new home!! 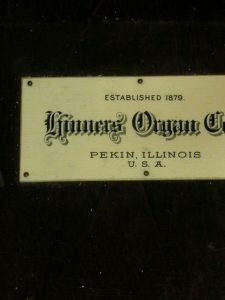 Relocation and Resurrection – Living Word Church, Roberts, Illinois – Hinners Organ #2696. 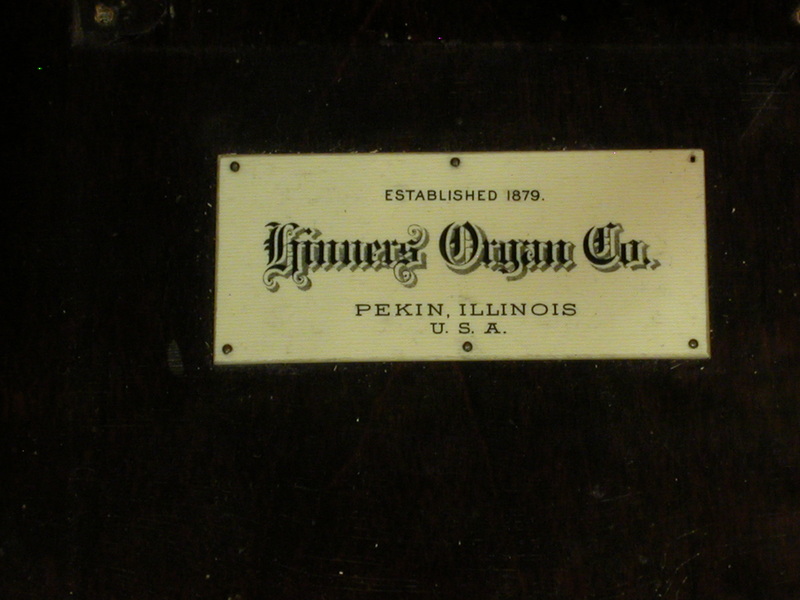 This two manual and pedal, 7-1/2 rank electropneumatic action organ appears to have originally been constructed by Hinners with tubular pneumatic action for an unknown location. 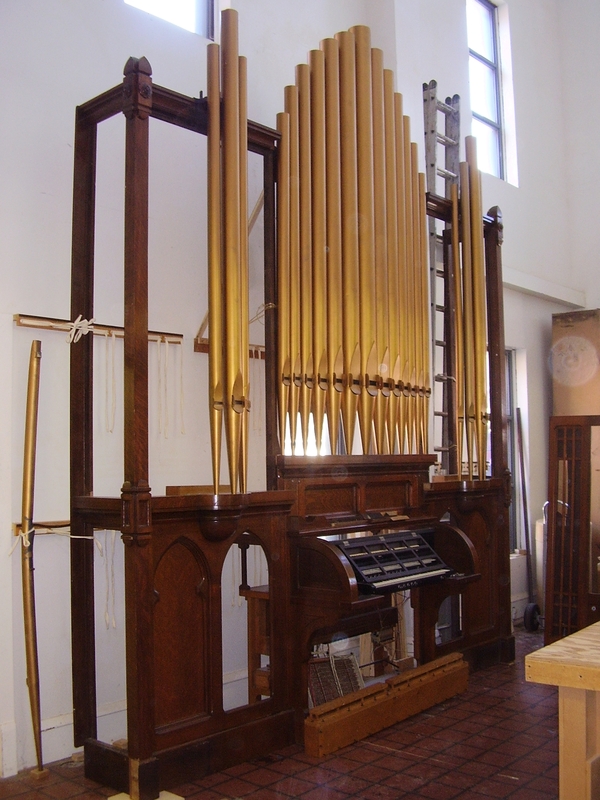 We believe that the original date of the instrument is before 1919, since the pitch of the organ is A-435. 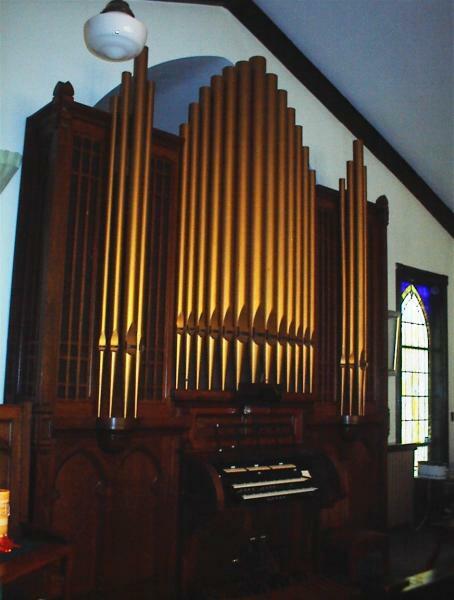 It was rebuilt by Hinners in 1924 with electropneumatic action and installed by them in the Sibley, Illinois Methodist Church. The manual windchests were originally designed to accommodate one more stop in each division, but the rest of the mechanism and pipes for these possible stops was apparently never completed. **There are 12 pipes for the 16’ octave of the Bourdon with a soft action for the Lieblich Gedeckt. Notes 13-32 of the Bourdon and Lieblich Gedeckt, and the 10-2/3’ and 8’stops each borrow the Swell Stopped Diapason with a separate action. At some time in the 1960’s or thereafter, the console mechanisms were replaced by supply-house equipment, by a Peoria technician. 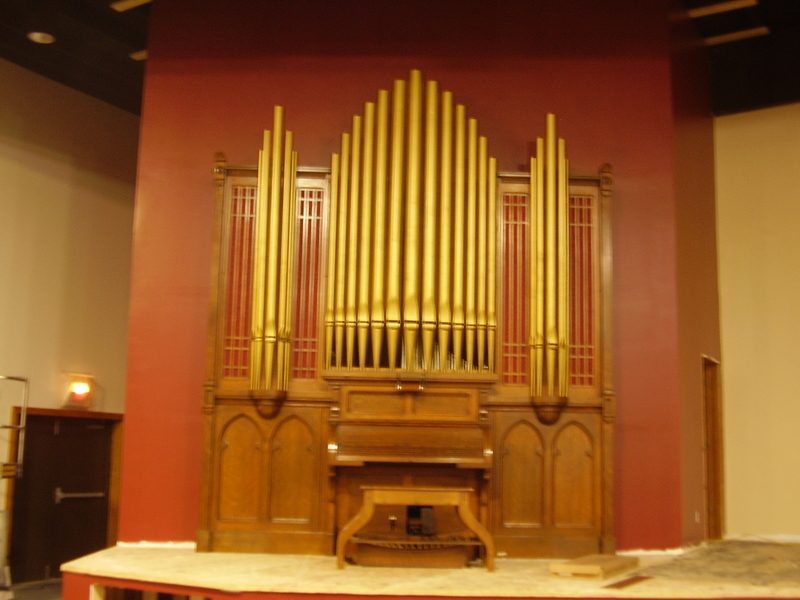 Buzard Pipe Organ Builders first encountered the organ in 2003, when restoration work was undertaken on the pneumatic actions for the speaking façade pipes. The organ continued in service until the Sibley Church closed in 2009. Keith Williams received a telephone call in May of 2010. A lady familiar with our restoration work elsewhere had purchased the organ at auction for installation at Living Word Church in Roberts. 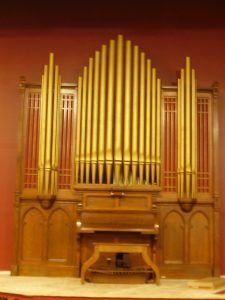 Would we be interested and available to remove the organ from Sibley? Of course! Then followed a conversation which will sound familiar to many of us in the profession. Removal was of course followed by the classic “hurry up and wait.” It would in fact be two years before Living Word Church completed preparations to receive the instrument (providing an elegant space when all was said and done, however!) From the outset it was made clear that the project must proceed with limited funds. We did convince the church that restoration of the main reservoir was an important step, since it would not be easily removable once the rest of the organ was erected. There was no way that we would be able to restore the windchests, even though we had no idea whether they still worked! Of course, money was in fact available to repair and repaint the façade pipes! At long last, as site preparations were being completed by church volunteers, we began work at the Buzard factory. Cotton-covered wiring had to be replaced to bring the organ into compliance with the revised electrical code. Pipes absolutely needed to be cleaned, and stoppers releathered (or nothing could have been tuned). Early in March, 2012 we had the organ winded in the factory, loaded the pipes, and Thanks be to God everything still worked! 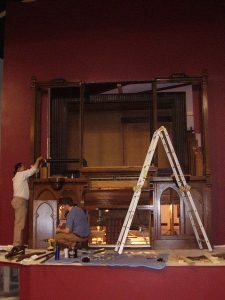 Everything was taken down, brought to Roberts, and the resurrected organ was first heard again on Easter Day, April 8, 2012! In this day and age when so many organs go unheard or sit in storage, we are deeply appreciative of the foresight of one woman who “just wants the young people to hear what a real hymn sounds like.” The future of this particular little organ is secure, and we look forward to its continuing in its intended purpose – to create another generation of churchgoers who know and love the pipe organ!